Looks like Sony’s just as excited about all the possibilities that Spider-Man: Into the Spider-Verse unlocks as we are. The Hollywood Reporter has news that, in the wake of much buzz about the incoming Into the Spider-Verse, Sony Pictures Animation has tapped the showrunners behind Dreamworks’ Voltron: Legendary Defender, Joaquim Dos Santos and Lauren Montgomery, to expand the animated corner of the Spider-hero world. 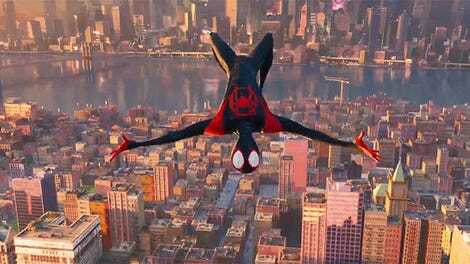 According to THR, Dos Santos is in early talks to direct the sequel to Into the Spider-Verse (penned by Wonder Woman 1984's Dave Callaham), although as of yet there are no details about just what the sequel will pertain to—whether it will still be mostly about Miles Morales, the Ultimate Spider-Man, or the wider concept of Spider-heroes working with each other across realities. Montgomery, meanwhile, will head a spinoff based around Gwen Stacy, the Radioactive Spider-Gwen. The Gwen movie will, like Spider-Verse, include multiple spider-heroes, but this time they’ll all be female. Nothing’s been confirmed yet, but THR suggests Madame Web (former overseer of the web of life and destiny that guides and binds all spider-based heroes together); Spider-Woman (presumably Jessica Drew, although technically Gwen goes by the moniker in her reality too); Spider-Girl (who again could be multiple comics characters, from Mayday Parker in the MC2 universe to Anya Corazon, the current holder of the mantle); and Cindy Moon, a.k.a. Silk (who was recently rumored to be getting her own film), as potential allies for Gwen to team up with. This speaks to Sony having some very high hopes for its animated Spider-adventures. Hopefully if Into the Spider-Verse lives up to the hype its fantastic trailers have been building, we could be looking at a very exciting new animated universe to explore through one of Marvel’s most iconic and versatile hero mantles.